I had the day off today and had it in my head that I was going to go for a ride despite the cold and snowy weather. As it turns out I was actually over-dressed and had to remove a layer. When I'm on a bike and riding through areas I normally wouldn't, I feel as if I'm a tourist in my own city...this is something that could never happen from a moving car. One of my stops, for example, was a bridge overlooking the Buffalo River, which (I believe) connects to the Erie Canal. 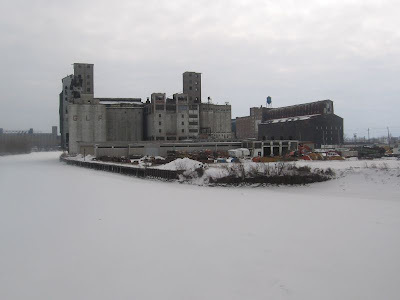 Anyhow, it's the site of many old and abandoned grain elevators, (and, interestingly, I learned today that grain elevators were in fact invented in Buffalo). Standing over the frozen river I found this scene particularly beautiful and tranquil. Later, after traveling down Michigan Avenue I came upon the Michigan Avenue Baptist Church, which was an important stop in the Underground Railroad. For many slaves this was their last stop before freedom into Canada. The church is still in use today, and is on the National Register of Historic Places; click here to visit their inspiring website. To read more about the church click here and here; to visit a site dedicated to the Rev. J. Edward Nash (the church's original pastor), click here.